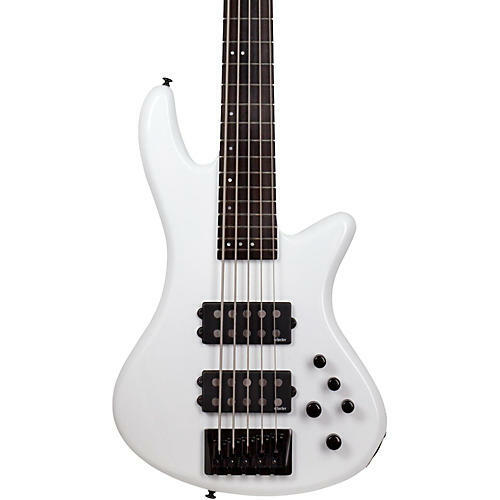 The Schecter Stiletto Stage-5 offers simple, useful controls paired with powerful bass tone to produce a hard-rocking axe with five strings of range. It features a mahogany body mounted to a thin-C three-piece maple neck with carbon fiber reinforcement rods, an ebony fretboard and 24 extra-jumbo frets. (Coolness point: the fretboard side makers glow in the dark so you can see them on stage.) The electronics consist of a pair of active Schecter Diamond SuperRock MM humbucker pickups controlled with master volume, blend and 3-band EQ.